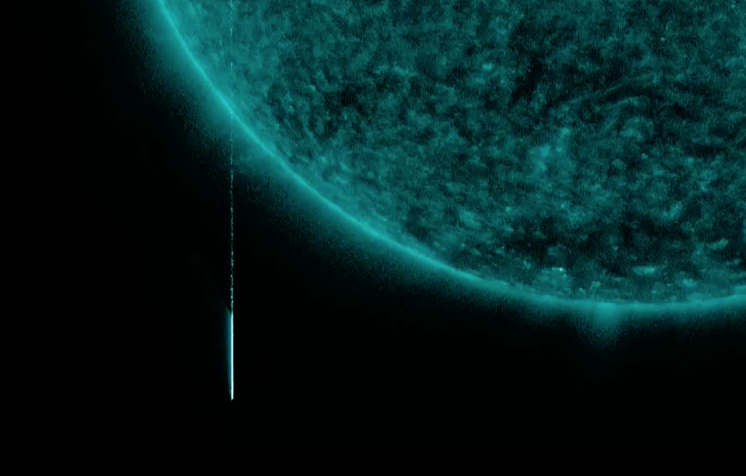 UFO SIGHTINGS DAILY: Giant UFO Exits The Sun On NASA Camera April 4, 2018, UFO Sighting News. Giant UFO Exits The Sun On NASA Camera April 4, 2018, UFO Sighting News. This UFO was found by The Watcher of Youtube today. The UFO shows that is a long glowing cylinder and that it left a trail behind it that seems to come from the sun. The UFO was traveling at such a high speed that it appears to be long, but is probably just round or disk like. This is more evidence that UFOs can and do enter and exit our sun.